Another hilarious chronicle about not-so-super-mom Samantha Smythe and her naughty children on a "family adventure"—the British beach holiday. With six demanding mouths to feed in her household Samantha Smythe doesn't even have time for a bath. Can all their problems be solved with some sea air at Beachcomber Bay? I am dreading saying it but this last novel in the series about Samantha Smythe wasn’t as fabulous for me as the first two. 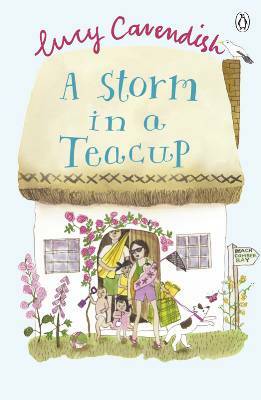 It’s not that I didn’t enjoy A Storm in a Teacup but I felt a bit let down when I realised we were going to be pursuing more of a plot in this story and less being entertained by Samantha’s quirky comments about life and her brood of children. I know that eventually Cavendish was going to have to move the plot along but I lost poor Samantha in A Storm in a Teacup. She was thoroughly engulfed by her mission to restore not only her mother-in-law’s garden in Devon but also to try and save the local historical home. I thought that the children and their problems took a little bit of a backseat to the restoration mission and I missed the focused relations between mother and children. I also missed her husband John who was absent for most of the novel too - one of the things I’d loved about the prequels was the reality of being a mother while also trying to be a wife. John and Samantha were very real to me and this didn’t come across in the third installment as much, I was getting a bit worried actually but it seemed to work out in the end! I did like the introduction of Jamie’s cross-dressing habit as well as Edward becoming a teenager and while I think it was absolutely necessary to introduce some new challenges I felt like they were given huge importance and then dropped and picked up again between the home saving plans. I also wished we’d been given more time with Baby Sparkle as she’d been such a focus of the last novel. Having said all this and done my complaining I can’t say that I didn’t enjoy the book - I wanted to know more about the family and I got it. I still love all the characters created by Cavendish and would leap on another installment like a life boat in a flood!